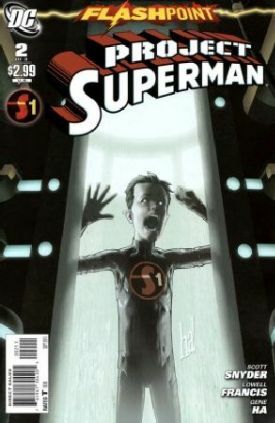 Subject Zero (LT Neil Sinclair), 20 years BF (Before Flashpoint) narrates as we see tween Kal-El being experimented on in a bunker a half mile below Metropolis. Kal's heat vision is in over drive as he is being pumped with solar energy. We have two parties in this scene with one side being very cold and wanting to control Kal and on the other side you have General Sam Lane who is trying to train and raise Kal as the son he never had. Furthering this view, Gen. Lane lets Kal play with Subject Two (Krypto) against the wishes of the cold scientist. It is in this scene with Krypto that we first see Subject Zero speaking to Kal at a volume only Kal can hear. Zero warns Kal to be careful, and not to trust "them". The story progresses another three years showing different experiments being done on Kal, and Zero teaching Kal to use his x-ray vision. We get another view of Gen. Lane reaching out to connect with Kal like a father, while also letting him know that if he works with them he could be a hero and help the world. Lionel Luthor shows up with his young son Lex to see Krypto, and Subject Zero somehow releases energy that fuels Krypto and sends him into a rage. Lionel tells Lex to be very still as father throws son in front of the vicious dog. Lex is attacked but we don't know if he dies. Krypto has a hole blown into his side as Kal protests on the other side of a window he appears to be cracking. At some point in the future Lane is being briefed on the Luthor situation when young Lois Lane shows up to wish her father a happy birthday. Gen. Lane wonders aloud about how Lois can keep sneaking into the secret facility as he is being made aware of a situation downstairs with Subject Zero who is freeing himself with a little help from Kal. Kal takes the now very tall Zero's hand and travels with him until he sees Zero mercilessly kill the cold scientist (and weird plant friends) who try to stop Zero from escaping. Gen. Lane leaves his office asking Lois to stay in place for once and she picks up a TOP SECRET document about Project Superman. She starts to leave as Kal super-speeds past her into Gen. Lane's office. Lois introduces herself and they reach for each others hands to make contact as Zero comes crashing into the room. He tells Lois about Kal and that he is an experiment and prisoner of her father's. Zero is about to kill Lois to teach Gen. Lane a lesson about sacrifice when Kal (who has been meek and afraid up to this point) steps in front of her in a defiant stance. Zero thanks Kal for his help in escaping as he appears to be creating an energy ball to kill both of them when Gen. Lane directs Zero to "Step away from my children". Wearing some strange contraption Gen. Lane sends himself and Zero to the Phantom Zone. Sometime later we see General Nathaniel Adam letting Kal know that he is in charge and that Kal will be participating in the experiments from now on. Gen. Adam lets him know that maybe he can fight for the US, or maybe not. After Adam leaves, Kal is alone and using his heat vision on the wall just out of view. The final frame shows that he has drawn a scribble of young Lois. Story - 4: While reading this story I enjoyed it very much, but that final frame really brought it all together to make me love it. This was really a heartwarming story, and I can't remember how many times I felt that type of feeling this strong in a comic. The story isn't perfect, there are so many questions that won't be able to be addressed in this short three issue series but in context with Flashpoint it is very well done. Just how powerful is Subject Zero, and other then the Doomsday DNA how did they give him these powers? Art - 4: The quality was a slight step down from the first issue, and that was immediately apparent in the X-ray frames. Where #1 showed master work with obvious painstaking time to show as much detail as possible, the X-ray frames in #2 looked like they took 1/4th of the time. They did continue to show a lot of detail in the action scenes with Zero and it almost looks 3D when he is doing his karate chops. The rest of the comic was very well done. Cover Art - 4: Again, in context this cover image is perfect. It doesn't give anything away other than what you already know according to our Flash Fact. It breaks the Superman fan's heart to see young Clark/Kal-El locked up. There could have been more detail on the wall, and I don't like the way the symbol looks like a sticker some one put on the cover post ink. I give the art a 3, and the intent a 5.